Host your next Chicago gathering at one of these rooftop venues and treat guests to amazing views and culinary and cocktail mastery. 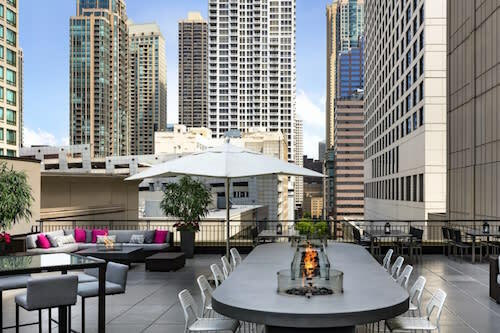 Set above the city with their own magical layouts, these Chicago hotel rooftops are the hottest spots to host your next cocktail hour or private dinner. Invite your guests to dine and mingle at Chicago&apos;s only tri-level rooftop venue. Creative American cuisine and cocktails are served atop the luxury lifestyle hotel at North Michigan Avenue and Wacker Drive. Expect modern design, sweeping vistas, distinctive history, and a landmark Chicago location. Private experiences range from a Chef&apos;s Tasting Menu (6 to 10 guests) to a Private Cupola (8 to 16 guests) that includes an exclusive menu accompanied by custom pairings from Dom Perignon to craft cocktails. The outdoor terrace area can host receptions of up to 75. 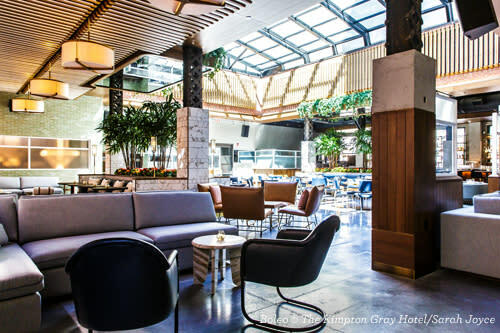 The Kimpton Gray Hotel is bringing a luxe-modern vibe to a historic landmark building with its rooftop lounge, Boleo, on the 15th floor. Boleo gives off a sultry, exotic vibe with its South American theme. Attendees can enjoy Peruvian and Argentinean-inspired street food favorites and snackable small plates and DJs pumping music under a retractable skylight roof. Rent the rooftop for your event of 12 to 250 guests or book Esperanza, Boleo&apos;s private lounge, for 12 to 20. Accessible through The Shops at North Bridge on Michigan Avenue, The Gwen has two great event spaces: the Upstairs At The Gwen rooftop (known for its summertime Prosecco popsicles) and the fifth-floor restaurant, Circa, where 1930s-inspired cocktail carts are available by reservation. The rooftop&apos;s Social Sips menu is great for post-meeting cocktails—the Prohibition Pomegranate Punch serves 6. Circa offers cozy banquette space to communal tables and private dining rooms for special events. Appropriately named, AIRE&apos;s 24th floor rooftop bar allows guests to feel the breeze above the city in a stunningly chic space. Enjoy small plates made from seasonal, locally sourced ingredients and a large creative cocktail and wine menu. Private event guests can soak up views to the east, south and west from couches and chairs surrounding artful fire pits. Host a cocktail reception from the rooftop and enjoy the bird&apos;s-eye view with catering from the hotel which includes shareable plates and small bites. 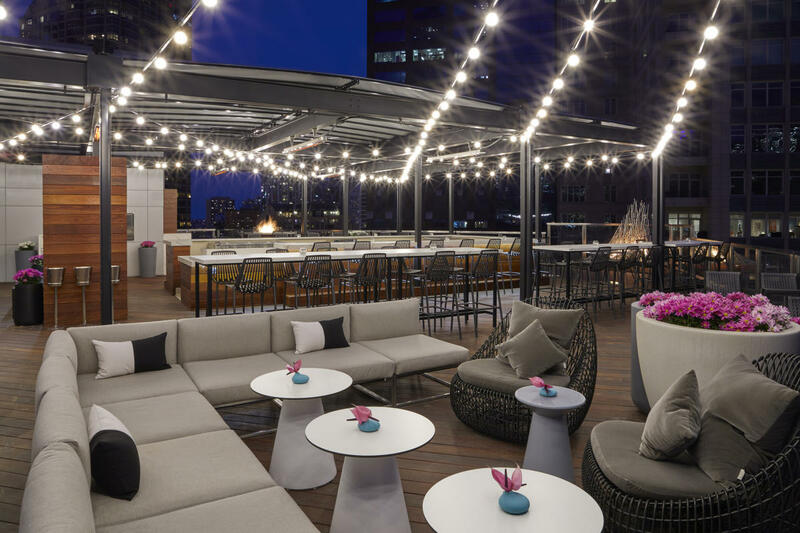 The ideal space for connecting and exchanging ideas, guests take in picture-perfect skyline views from the open rooftop deck situated above State Street and Wacker Drive. 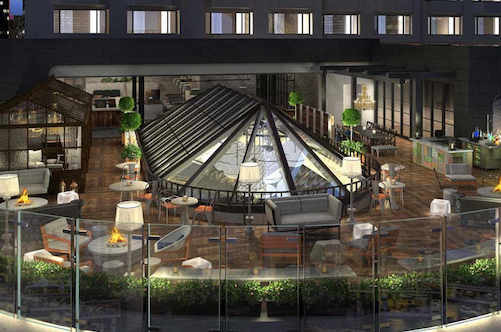 A play on elevated service and the raising of the iconic bridges that line the Chicago River, Raised An Urban Rooftop Bar is a hip indoor/outdoor hotel lounge featuring craft cocktails and small plates. Raised garden beds, private VIP cloches, fire pits, seating for 160 and 14 taps with local beers round out the experience. 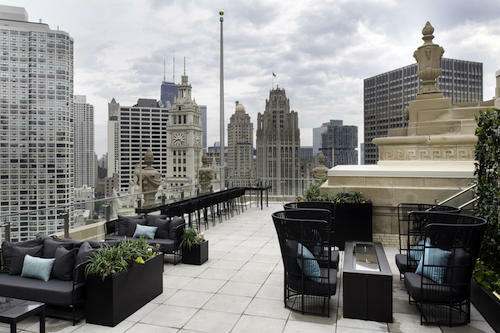 Located on Chicago&apos;s Magnificent Mile on Erie Street, the new Conrad rooftop whisky bar is under construction with a summer 2016 opening date. Noyane offers panoramic skyline and Michigan Avenue views and globally inspired architecture and design. The 20-story hotel is now accepting reservations for stays after September 15, 2016. Tailored for groups and meetings, the Conrad will assign a dedicated phone number to clients that they can use to text an on-site dedicated event specialist throughout the day/night.